We go north of the border again for another episode of the popular “Light Up and Listen Club” program heard for several years on Canadian radio stations and sponsored by Sweet Caporal cigarettes. Program 327 in the series features the novelty group, the Vass Family and the first song is “Louisiana Hayride”. They also do their own version of the “Little Red Riding Hood” story in song. These kids are downright goofy, aren’t they? 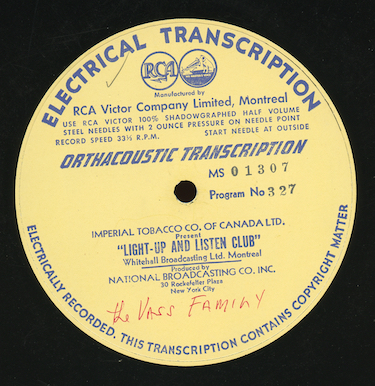 Our program was transferred from an original RCA Orthacoustic vinyl transcription, matrix number MS 01307.